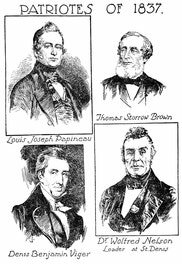 The opposition to the arbitrary rule of the Government of Lower Canada developed, in 1837, into armed rebellion in the valley of the Richelieu, and in the county of Two Mountains, northwest of Montreal. 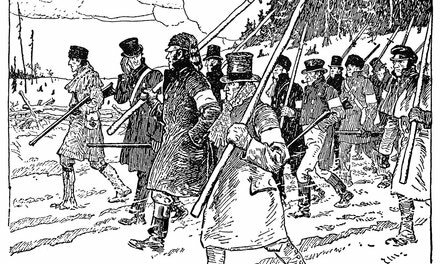 It broke out first at St. Denis on the Richelieu, where on November 23rd the Patriots defeated the force of British regular troops sent to suppress them. The news of their victory reached St. Eustache in Two Mountains on the 26th. The rebels in that district gathered to the number of nearly a thousand, under the leadership of Amaury Girod, an adventurer of mysterious origin, and Dr. J. 0. Chenier, the young physician of the village. Some of the loyalist inhabitants fled to Montreal and informed the Governor, Sir John Colborne, of their proceedings, but he waited until he had crushed the insurrection on the Richelieu before he moved to suppress the Patriots at St. Eustache. On December 13th he set out with over two thousand men, regular British troops and loyalist volunteers, with light field guns. Next day he attacked the village, where the rebels, after a skirmish on the ice of the frozen river, had barricaded themselves in the church, the presbytery, and the convent. 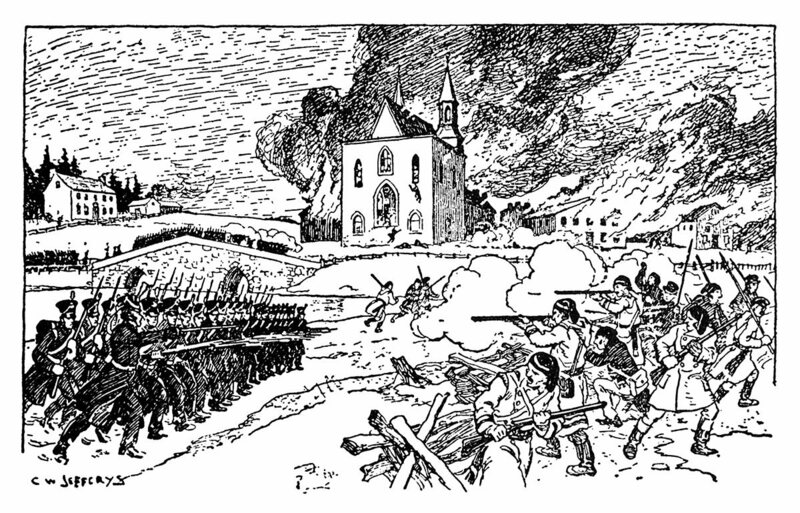 The fiercest fighting took place around the church. The artillery bombarded it, but its stout masonry resisted its fire. Under cover of the smoke the troops charged, got into the church and set the interior on fire. Many of the rebels were shot down, among them Chenier. Girod abandoned his men and fled, and after avoiding capture for four days, blew out his brains. A large part of St. Eustache and its neighbouring village, St. Benoit, was burned and pillaged. The church still stands, its walls scarred and pitted by the cannon balls. Gamester, George. “Publisher feuds with Imperial Oil Ltd.” In Toronto Daily Star, May 13, 1971, p. 8. Illus. Kilbourn, William. “Time to listen to voice of French Canada: historian.” In Toronto Star, Nov. 22, 1976, p. C3. Illus.